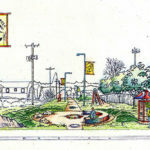 Rainier Beach Moving Forward (RBMF) a neighborhood-based organization lead by neighborhood residents is dedicated to implementing the updated Rainier Beach 2014 Neighborhood Plan (RB 2014). We are inviting you to join in the exciting discussion around strengthening the relationships within the Rainier Beach neighborhood. 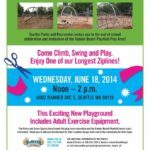 We are all aware on some level, of the great works and shared passions amongst the local residents, organizations, learning institutions and business community in Rainier Beach. 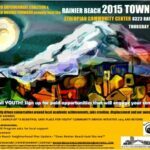 This Neighborhood Summit is intended to bring all persons invested in the growth and sustainability of Rainier Beach together, highlighting our like causes, in order to create connections and working linkages through projects, initiatives and programming called out in RB 2014.
handicap accommodations, questions or concerns. 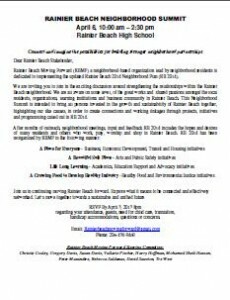 January 14, 2013 Rainier Beach hires a Neighborhood Coordinator!! NextIt’s Official: Rainier Beach High School International Baccalaureate Program Starts Next Fall!